Bestselling authors Laurie Kirszner and Stephen Mandell know what works in the classroom. 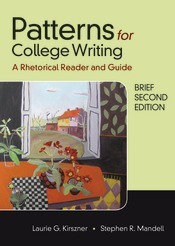 In Patterns for College Writing Brief, they provide students with exemplary rhetorical models and just the right balance of classic and contemporary essays. Patterns Brief includes comprehensive coverage of active reading, research, and the writing process in a five-chapter mini-rhetoric. This is followed by clear and thorough explanations of the patterns of development with the most thorough apparatus of any brief rhetorical reader and an example of student writing for each pattern. Add to that the most comprehensive coverage of argumentative writing and you will see why Patterns for College Writing Brief is the best-selling reader in the country. The new edition includes exciting new readings, images, and debate and casebook topics.